On behalf of the International League of Peoples’ Struggle, I thank the Filipino Refugees in the Netherlands and the Netherlands chapter of the ILPS for inviting me to deliver the keynote address. It is an honor and privilege to be among the distinguished speakers, the members of the ILPS International Coordinating Committee, and all other participants in this symposium on demanding justice for imperialist crimes against humanity. I am deeply pleased that representatives of revolutionary movements in Palestine, Kurdistan, Philippines, Ireland, Belgium and other countries are here. It is my assignment this afternoon to try setting the context and tone for the presentations and discussions by describing the foundations and motivations of imperialist aggression and pointing to the most important tasks of the people in struggling against imperialism and achieving revolutionary objectives. On my personal account as a public intellectual, I speak of the task of building the revolutionary party of the proletariat. As chairperson of the ILPS, I speak of the task of building the anti-imperialist and democratic movement of the broad masses of the people. Adam Smith and his successors have pontificated that the supposed invisible hand of self-interest in the capitalist market has produced the social good through the ever dynamic balance of supply and demand. Indeed, capitalism is founded on greed and exploitation. And to keep the system of exploitation going, there is the concomitant system of oppression. The bourgeois state or the class dictatorship of the bourgeoisie consists of the instruments of coercion, such as the army, policemen, the courts and prisons, to enforce the law of the oppressor class against the working classes of workers and peasants. The bourgeoisie used the most vicious methods of exploitation and oppression in the primitive accumulation of capital. Workers, including women and children, were forced to work extremely long hours, 14 to 16 hours a day for six days a week, and accept extremely low wages. The enclosure movement or similar actions of the bourgeoisie deprived the peasants of the land in order to proletarianize them in the course of making capitalist farms, force the dispossessed peasants to take factory jobs and make a reserve army of unemployed manpower to press down the wage level. Colonialism and slavery were major components of the primitive accumulation. Forced labor was used and natural resources were plundered in the colonies. Men and women were abducted in Africa and traded as slaves. Marx and Engels explained how new economic values are created by labor power by using the equipment and raw materials in the process of production, and how the owners of capital take away a greater amount of surplus value by pressing down the wages paid to the workers. The crisis of overproduction arises because the capitalist exploiters keep on increasing profits and accumulating capital by pressing down wages. As a result, the market slumps because the workers cannot afford to buy the very goods they produce for their consumption. The use of finance capital to override the economic crisis with the ever growing private and public debt, and likewise to override the tendency of the profit rate to fall, has resulted in financial bubbles and financial crises. The recurrent bouts of economic and financial crisis result not only in worse conditions of the working class but also in the intensified competition of capitalist firms, leading to the bankruptcy of weaker capitalist firms and the ultimate growth of the winning capitalist firms into monopolies. Thus, towards the end of the 19th century, the era of free competition led to monopoly capitalism or modern imperialism. Lenin described the features that characterize the imperialist countries. Monopoly capitalism has become dominant over society. Industrial capital and bank capital have merged, thus creating a financial oligarchy. The export of surplus capital has gained importance over the export of surplus commodities. Monopoly capitalist firms based in various countries engage in combinations like syndicates and cartels in order to compete with and prevail over their competitors. The competition for economic territory and the struggle for a redivision of the world intensify among the monopoly capitalist powers, which form blocs against each other. Towards the beginning of the 20th century, there was no longer any part of the world, outside of the imperialist countries, which was not somehow covered by the earlier colonial powers as colony, semi-colony or dependent country and as a source of cheap labor and cheap raw materials, as a market, as a field of investment or as spheres of influence. To join the colonial game in order to gain economic and political advantage over other countries, the new players jointly and separately took a collision course with the old players. Thus, a series of wars occurred from 1898 to the eve of World War I (the Spanish-American War of 1898, the Anglo-Boer War of 1899-1902 and the Russo-Japanese War of 1904-05) to signal the arrival of the era of modern imperialism and manifest the extremely violent and aggressive character of monopoly capitalism. State monopoly capitalism arose to bring the domestic crisis under control and to ensure preparedness for wars of aggression. It emerged overtly in the form of state monopoly companies or, as in the US, through private companies favored by state subsidies and contracts to produce war equipment. The first full-scale global inter-imperialist war between two imperialist powers, the Allied Powers and the Central Powers, broke out in 1914. It signified the inability of the imperialist countries to peacefully solve their domestic economic and social crisis and the general crisis of capitalism. World War I cost the lives of more than 23 million people. It proved beyond doubt the moribund and aggressive character of monopoly capitalism. Far more telling was the victory of socialist revolution over one-sixth of the surface of the earth in the October Revolution of 1917. The Bolsheviks and the Soviet Union showed how a new social system could arise and develop through the exercise of proletarian class dictatorship against the bourgeoisie, the growth of socialist industry and collectivization of agriculture through a series of 5-year economic plans, and the promotion of a socialist culture ennobling the working people and inspiring them to achieve greater revolutionary victories. They established the Third International to cause the establishment of the revolutionary parties of the proletariat and encourage the advance of movements for national liberation and socialism. The Soviet Union was flourishing when the world capitalist system was again wracked by a general crisis (the Great Depression) and the rise of fascism, while two blocs of imperialist powers were threatening each other. In due time, World War II broke out between the Allied and Axis Powers. It was essentially an inter-imperialist war. But this time, the Allied Powers could not have won if not for the immense Soviet war effort, leading to the decisive defeat of Nazi Germany at Stalingrad and the subsequent Soviet counteroffensive which liberated Eastern Europe and the eastern part of Germany. The war cost the lives of more than 50 million people, including those of 27 million Soviet people. The communists excelled in fighting the fascist powers. As a result, people’s democracies and socialism came to power in several countries. The colonial system weakened. One third of humanity were in countries under the leadership of communist and worker’s parties up to the time Khrushchov and modern revisionism came to power in the Soviet Union in 1956. China won power in 1949 and became one giant bulwark of anti-imperialism and socialism. National liberation movements continued to grow in strength in Asia, Africa and Latin America. Among the imperialist powers, the US emerged as the No. 1 economic and military power. It spearheaded the establishment of the United Nations and the Bretton Woods Agreement. It declared the Cold War against the socialist countries and carried out wars of aggression against peoples in the third world. In 1951, the Korean people defeated the US war of aggression and its scheme of occupying the entire Korean peninsula. The Vietnamese and other Indochinese people defeated the US war of aggression in an even more resounding way in the middle of the 1970s. Modern revisionism turned the Soviet Union into a monopoly bureaucrat, social fascist and social imperialist power. The US and the Soviet Union competed in the practice of neocolonialism. China stood for the cause of national independence and socialist revolution and construction. Under the leadership of Mao Zedong, the Chinese Communist Party stood for Marxism-Leninism and for the proletarian revolution, combated modern revisionism, imperialism and reaction and carried out the Great Proletarian Cultural Revolution from 1966 to 1976. But the Dengist capitalist counterrevolution categorically defeated socialism in 1978. By 1975, the US was already crisis-stricken and in a process of decline because of stagflation brought about by its high military spending and wars of aggression, and the competition offered by Germany and Japan. In 1980, it began to carry out its economic policy of neoliberalism, imposed it on the entire capitalist system, and used it to engage both the Soviet Union and China by extending loan and trade accommodations. By 1989, the US was in a far worse position than in 1975. It had accelerated its military spending, it had become the biggest debtor country in the world and its manufacturing base had been significantly undermined. Japan was also on the eve of beginning its decades-long stagnation. But the crisis of the US and world capitalist system was obscured by the events of 1989 to 1991 that were interpreted as the final fall and death of socialism. These included the outbreak of mass protests against corruption and inflation in some 80 cities of China and the Tiananmen protests which led to the Dengist massacre in 1989, the breakdown of the Soviet bloc revisionist regimes, the full scale privatization of public assets in an undisguised restoration of capitalism, and the collapse of the Soviet Union in 1991. The bourgeois ideologues and publicists trumpeted that history could no longer go beyond capitalism and liberal democracy, and that peace dividends would come from the end of the Cold War and from the acclamation of US imperialism as the sole superpower. Since the end of the Cold War, however, the US has freely imposed its neoliberal economy on the whole world and has unleashed a series of aggressive wars to break up Yugoslavia, to destroy the Saddam government in Iraq, to oust the Taliban government in Afghanistan, to overthrow the Qaddafi government in Libya, and now to seek the overthrow of the Assad government in Syria. The bankruptcy of the neoliberal economic policy has been thoroughly proven. It has resulted in a series of economic and financial crises, which are increasingly worse and which have led to the current crisis that started in 2008. This is comparable to the Great Depression that led to World War II. The US imperialists, their allies and puppets have been boasting that the full restoration of capitalism in China and Russia has killed the revolutionary cause of national liberation and socialism once and for all time. But the integration of Russia and China into the world capitalist system has in fact led to the intensification of inter-imperialist contradictions. The BRICS Bloc has emerged as a foil to the US hegemony over the global economy. The Shanghai Cooperation Organization is also a foil to the aggressiveness of the US-NATO combine. All major contradictions in the world are sharpening: between the imperialists and the oppressed peoples and nations; between the imperialist powers and the self-respecting independent states; among the imperialist powers themselves; and between labor and capital in the imperialist countries. The conditions are favorable for the rise and spread of armed revolutionary movements for national and social liberation, for independent states to become more assertive, for the peoples of the world to take advantage of the inter-imperialist contradictions; and for the proletariat in imperialist countries to wage fiercer class struggle against the big bourgeoisie. The most important tasks in the anti-imperialist struggle include the following: building the revolutionary party of the proletariat that leads the anti-imperialist struggle; waging the anti-imperialist and democratic mass struggles in the imperialist countries and in the dominated countries; bringing the anti-imperialist and democratic struggles to the level of social revolution; and promoting and strengthening proletarian internationalism and international anti-imperialist solidarity of peoples. Since the rise of modern imperialism as the dominant force in the world, the class struggle of the bourgeoisie and the proletariat has intensified and become the most crucial dynamic in the process of social revolution. The necessity of proletarian-socialist revolution is most discernible in the industrial capitalist countries even as the struggle for democracy must be waged against repression and the threat of fascism. The socialist revolution is definitely prepared by a new type of democratic revolution led by the proletariat in the underdeveloped countries. The era of modern imperialism and proletarian revolution has been validated without any doubt by the emergence of socialist countries as a result of capitalist crisis and inter-imperialist wars. Although modern revisionism has dealt a major blow to the cause of socialism and has effected its strategic retreat, the class struggle between the bourgeoisie and the proletariat has persisted and has intensified as a result of the severe economic and political crisis generated by neoliberal economic policy and the recurrent wars of aggression. At this stage of world history, the proletariat is the most advanced productive and political force. It is capable of emancipating itself and other exploited classes. And it is capable of bringing about socialism after seizing political power from the bourgeoisie. It must have for its advanced detachment a revolutionary party. This must be built in order to lead the proletariat in the class struggle against the bourgeoisie and achieve the overthrow of the bourgeois dictatorship and the establishment of the proletarian dictatorship. In the process, it must lead the broad masses of the people in order to defeat imperialism. The revolutionary party of the proletariat must build itself ideologically by educating its cadres and members on the basic principles of Marxism-Leninism-Maoism in philosophy, political economy and social science, and training them to apply materialist dialectics in analyzing history and current circumstances. They must understand materialist and historical materialism, political economy from capitalism to socialism, the strategy and tactics of proletarian revolution, and the ever continuing process of socialist revolution and construction towards the threshold of communism. They must combat subjectivism and rise to the level of understanding how to fight and defeat revisionism. The revolutionary party of the proletariat must build itself by adopting and implementing the general line of political struggle based on the concrete social conditions, and by arousing, organizing and mobilizing the people accordingly. There are two very distinct types of societies in the world today: the industrial capitalist societies and the underdeveloped pre-industrial societies. In the industrial capitalist countries, the general line of socialist revolution applies, but the struggle for democracy must be taken into account because the monopoly bourgeoisie is bound to use state terrorism or fascism to prevent socialist revolution. In the underdeveloped pre-industrial societies, the general line of people’s democratic revolution based on the worker-peasant alliance is a necessary preparation for the consequent socialist revolution. If truly revolutionary, the proletarian party in any country must seriously study the Marxist-Leninist theory of the state and revolution and the historical experience of the working class in applying the theory. No exploiting ruling class is ever willing to give up its power voluntarily. And it is the central task of the oppressed and exploited people to develop the process of armed revolution in order to forcibly seize power from the exploiting ruling classes. In the underdeveloped pre-industrial countries, the chronic crises and extreme conditions of exploitation and oppression allow the proletarian revolutionary party to organize the people’s war. But even in the industrial capitalist countries, it is possible to organize armed self-defense groups against criminality and state repression, or even just sports gun clubs. Such groups can transform themselves into revolutionary combat units against intolerable oppression or in the course of transforming an imperialist war to a civil war. But arms are of no use for a possible revolution if in the first place there is no revolutionary mass movement. There must be mass organizations of the workers, peasants, women, youth, minority nationalities, and other exploited and oppressed people, and these must be engaged in developing mass movements that uphold, defend and promote the political, civil, economic, social and cultural rights of the oppressed and exploited. These mass organizations can develop their groups for self-defense. And the mass movements must become so strong as to create influence and following even within the counterrevolutionary apparatuses of the state, especially among the personnel recruited from the exploited classes and who continue to suffer oppression and exploitation by the system and by their corrupt and bullying officers. When the revolutionary party of the proletariat is successful at educating and organizing the revolutionary mass organizations, it can also be successful at mobilizing not only their mass following but also the masses which are not organized or who belong to other organizations. Being successful at arousing, organizing and mobilizing the masses, the revolutionary party of the proletariat can engage in alliances with other parties, organizations and personages who agree to a united front against imperialism and reaction on particular issues or a whole range of issues. In having its own mass base and allies, the party can easily build its self-defense groups or even an entire people’s army. The membership of the revolutionary party can increase only on the basis of an increasing mass base. The mass organizations are the recruiting ground for the party. The party makes it a point to recruit as its candidate members those mass activists who come from the ranks of the toiling masses of workers and peasants and the urban petty bourgeoisie, and those who have shown resoluteness, militancy and willingness to join the revolutionary party of the proletariat, to study, and to work harder for the advance of the revolution. The revolutionary party of the proletariat must build itself organizationally on the basis of the mass organizations and ensure that it is deeply rooted among the toiling masses and has a national scale. It must follow the principle of democratic centralism. Decision-making is based on democracy and is guided by centralized leadership. At every level of the organization, the majority prevails over the minority vote. The higher organs prevail over the lower organs. The Central Committee is responsible for centralized leadership in accordance with the Constitution and Program and the decisions of the Congress. In each country, the revolutionary party of the proletariat wages all forms of struggle to fight and defeat imperialism, its allies and puppets. The most decisive form of struggle is the armed struggle because it is the most effective way for ending the class dictatorship or state of the bourgeoisie, and installing either a socialist state or a people’s democracy under the leadership of the working class within certain national boundaries. At the same time, the proletariat and people of the entire world must unite and fight to defeat imperialism and allies because these are an international force exploiting and oppressing the entire humankind. The working class and the rest of the people who are in the belly of the beast in the imperialist countries have a special duty in defeating imperialism in its own home ground. The metaphor should be well understood. If you are in the belly, you can hit the heart and other vital organs of the beast, especially when it brings to you one catastrophe after another. In the other parts of the world, the overextended body, arms and legs of imperialism are vulnerable to the people’s counteroffensives and can also make the beast bleed to death. It is important for the revolutionary parties of the proletariat as well as the mass organizations and mass movements of the exploited and oppressed to hold their respective international gatherings to share ideas and experiences and learn from each other on how to fight imperialism most effectively and how to take advantage of the economic, social and political crisis and the inter-imperialist contradictions. The world proletariat and the revolutionary parties of the proletariat must raise high the Red banner of proletarian internationalism against the imperialist powers. The peoples of the world must further strengthen their international anti-imperialist solidarity. The respective international gatherings of proletarian revolutionary parties and of the people’s organizations can initiate and carry out international campaigns against imperialism on the issues of oppression, exploitation and environmental destruction. As a global alliance of mass organizations and mass movements, the International League of Peoples’ Struggle has successfully launched anti-imperialist and democratic campaigns of mass work and political action on the following major concerns: the cause of national liberation, democracy and social liberation; socio-economic development and social justice; human rights in the civil, political, economic, social and cultural fields; the cause of just peace; independent trade union and workers’ and toilers’ rights and reduction of working hours at full pay against mass unemployment and decreasing wage levels; agrarian reform and rights of peasants, farm workers and fisherfolk; the cause of women’s rights and liberation; rights of the youth to education and employment; children’s rights against child labor, sexual abuse and other forms of exploitation; rights of indigenous peoples, oppressed nations and nationalities against chauvinism and racism; the rights of teachers, researchers and other educational personnel; the right of the people to health care and the rights of health workers; science and technology for the people and development, and environmental protection; arts and culture and free flow of information in the service of the people; justice and indemnification for the victims of illegal arrest and detention; rights and welfare of displaced homeless persons, refugees and migrant workers; and rights of gays, lesbians, bisexuals and trans-gendered. 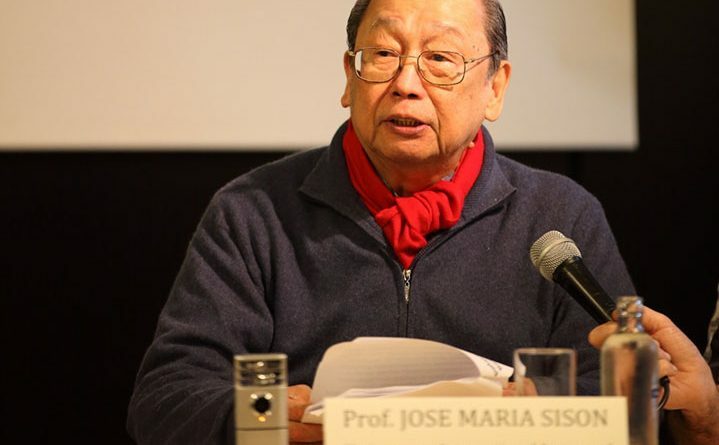 As Chairperson of the International Coordinating Committee of the International League of Peoples’ Struggle, I am happy to announce that we have just concluded a meeting of the aforesaid committee to review the work of the ILPS and to prepare for the Fifth International Assembly of the ILPS in Manila in November this year. Your mass organizations and mass movements are invited to participate. We hope to work harder and achieve greater victories in the anti-imperialist and democratic struggle. Thank you.